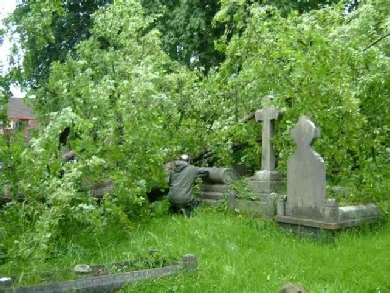 On the evening of Friday, 8th June, 2012 one of the large trees in the Churchyard was blown down. Some damage was done to a number of the nearby graves but thankfully no damage to the Church building or surrounding 150 year old cast iron fence. 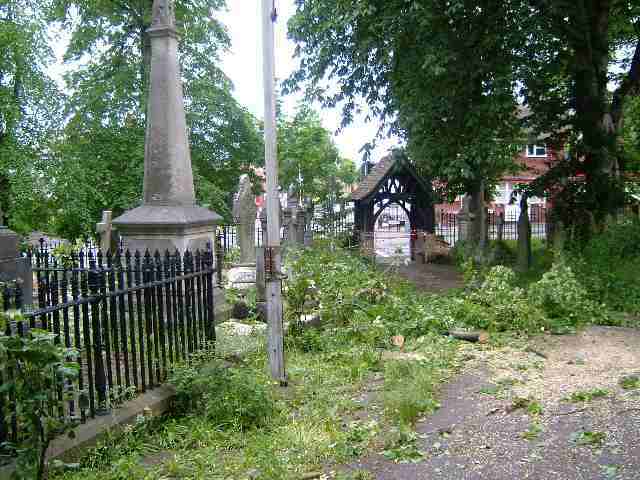 The tree was swiftly removed by tree surgeons and the area tidied. Had the tree fallen across the road then the situation would have been far more serious. The view looking across High Street, Amblecote one of the main routes into Stourbridge. 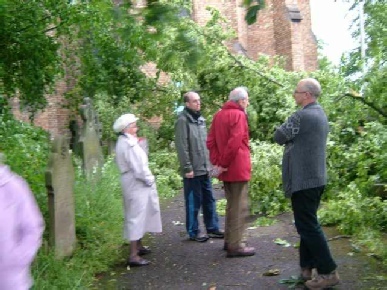 A member of the Parochial Church Council inspects the damage. A tree surgeon cuts the trunk into manageable chunks to facilitate removal. The clean-up is almost complete - a little time to stand back and admire their handiwork.